Charlotta Larsson is currently one of Sweden’s most successful lirico spinto sopranos. Throughout her career, she has performed regularly at Scandinavian opera houses such as the Royal Swedish Opera, Gothenburg Opera, Malmö Opera, The Royal Danish Opera in Copenhagen and the Norwegian National Opera in Oslo. After her triumphant opera debut as Liù (Turandot) at Folkoperan in Stockholm in 1993, her significant stage talent was immediately recognized and she was offered roles such as Pamina (The Magic Flute), Donna Anna (Don Giovanni), Ilia (Idomeneo) as well as the title roles in Rusalka and Suor Angelica – all of them at major Scandinavian opera houses. Venturing further into the Italian opera repertoire, Charlotta Larsson was engaged in roles such as Mimì (La Bohème), Salome (Stradella), Violetta (La Traviata), Desdemona (Otello), Giorgetta (Il tabarro) and the title role in Aida. Other significant roles in her repertoire are Tatiana (Eugen Onegin), Michaëla (Carmen), la Contessa (Le Nozze di Figaro), Madame Lidoine (Les Dialogues des Carmélites), Marguerite (Faust) and Cio-Cio San (Madama Butterfly). 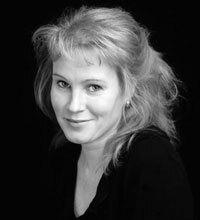 In 2009 Charlotta created the title role in the Scandinavian première of Samuel Barber’s Vanessa at Malmö Opera, for which she received tremendous critical acclaim and a nomination for the Swedish OPERA-prize. She sang Vanessa again in spring 2011 at the Wiener Konzerthaus and also in fall 2012 in her Germany-debut at the Frankfurt opera. Among her early concert engagements were several opera recitals at the Royal Castle in Stockholm featuring a. o. mezzo soprano Doris Soffel and the late Gösta Winbergh and a Puccini Gala with tenor Aleksanders Antonenko and conductor Paul Mägi. Charlotta’s concert repertoire includes works such as Berg’s Sieben Frühe Lieder, Strauss’ Vier letzte Lieder and Wagner’s Wesendonck-Lieder. No stranger to contemporary music, she has participated in the Scandinavian premières of Jacqueline Fontyn’s enigmatic song cycle Blake’s Mirror at The Stockholm Concert Hall and John Adams’ El Niño in Oslo. Among other recent and upcoming engagements to be mentioned are Marschallin in Rosenkavalier and Amelia in Un Ballo in Maschera at the Malmö Opera, the Countess in Capriccio at the Royal Swedish Opera in Stockholm and Katerina in The Greek Passion at Wermland Opera with Mira Bartov directing.